Who doesn’t love gardens full of flowers, trees, and lush green bushes? Well, everyone does. Gardens not only look pretty but bring in the freshness too. But it is not as simple as that. If you want a fresh and lush green garden you need to take care of that. Just like animals and humans, plants need care too. You are a plant lover and love to keep your plants healthy and fresh, so the best choice is to hire professional gardening services. Getting professional help is important because the services provided by a team of highly-skilled gardeners will give you the best possible results. 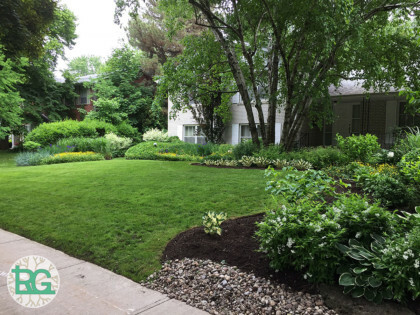 If you are looking for the best gardening services in Toronto, Ontario, then Rainbow Gardening is the one you should always trust. With many years of experience, we provide very specialized support and attention to detail. The first thing which is really important for keeping your garden fresh is maintenance. You should maintain the garden by trimming the bed edges and the shrubs as well using strategically placed irrigation to ensure the roots get the proper soaking. Gardening is one of the most important parts to keep your plants healthy and free from pesticides. You may want to discuss sprucing up your garden with some colourful perenniels. You love your garden so hiring a professional to help with maintenance is a perfect choice. Finding a reliable and professional gardening company can be a challenge; don’t worry, Rainbow Gardening is always here to help. Maintaining your yard may not seem like a big deal. It might prove to be a little challenging at times, though. But it isn’t too hard. It just takes time and can prove to be challenging at times due to the fluctuations in the weather during different seasons. When considering professional help to maintain your yard, give us a call at Rainbow Gardening; we are always at your service. There are a few things which you should know in order to protect your yard and maintain it properly. You should be careful not to over fertilize your lawn for those areas lacking proper sunlight. Doing so can damage and kill the grass instead of promoting healthy growth. Rainbow Gardening has many years of experience with maintaining lawns big or small. Who doesn’t want their garden to look beautiful? Your dream is to have a home with a beautiful lawn and surrounding gardens. We offer professional help to add in various textures, colours and overall “eye appeal” for your home landscaping. You can consider having new gardens built with new bushes or trees strategically planted. We are specialists at giving your property the “proper flow” in terms of layout and placement of gardens filled with flowers, perennials and other eye appealing products. Rainbow Gardening provides the best gardening services in Toronto, Ontario. Let’s sit down together and work on a plan to update the look and feel of your valued property.